Sorghum ( Sorghum bicolor ). The caterpillars are initially green, but later instars can become brown with black stripes. The caterpillars vary their colour according to their degree of crowding. If sparse, they are inclined to be greener. If crowded they become darker. This has been found to correlate with an increased resistance to disease if crowded. 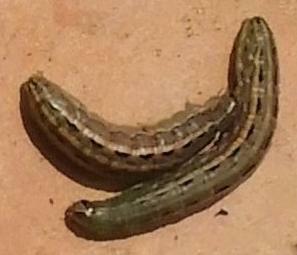 They often advance in a mass across field, consuming the grass as they go (hence the term "Armyworm"). They do this blatently in full daylight. This is extensively illustrated in the BBC video "War of the Worlds" in their series: "Alien Empire". The young caterpillars only eat the surface layer of the leaf, but later instars eat large pieces out of the sides of the leaves. The adult moth is brown with a pattern of light and dark markings on each forewing. The hindwings are silvery white, with brown edges and veins. The pheromones of this species have been identified. 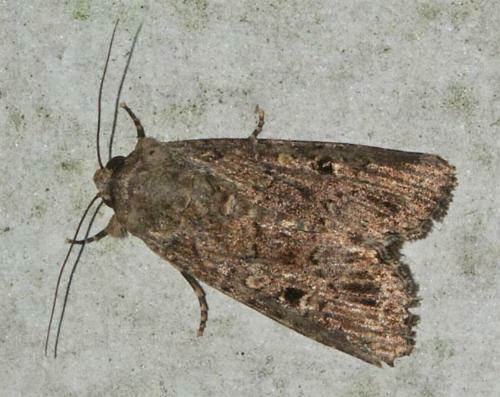 The adult moth has a wingspan of about 3 cms. It undertakes periodic migrations, which complicate the control of the species. These have been observed by radar. Melbourne University Press, 1990, pp. 42, 65, 462. Part 10 (1857), p. 355, No. 114.